Deliciously creamy, crumbly Boursin® cheese infused with intense garlic, fragrant parsley, chives and seasoning. Classic French cheese made in Normandy, presented in a recloseable box. Brings French flair to appetizers and party snacks. Attractive and popular choice for a cheese board. Soft cheese - great for spreading on crackers or baguette. Fine to eat whilst pregnant - made with pasteurized milk and cream. Suitable for vegetarians. Appealing appetizers Family-gathering or partying with friends? Boursin® is a versatile friend to bring panache to your party snacks or brio to your buffet! Try Boursin® mini-pittas with pomegranate, or Boursin®-topped bruschetta with red onion and tomatoes for an unusual twist to your nibbles The hero of your cheese board Boursin® Garlic & Herbs is a mouth-watering choice for perfect cheeseboarding. Its gorgeous, full-bodied taste complements the milder cheeses, and its softer texture contrasts with harder cheeses. The round shape and elegant silver-foil wrapper bring some extra visual appeal?making your cheeseboard a feast for the eyes as well as the tastebuds! More mouthwatering moments?. Fancy a little evening treat? 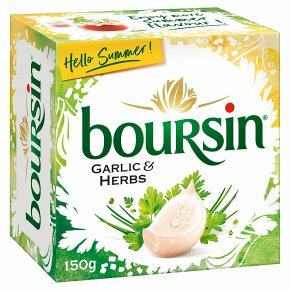 Lavish some Boursin® Garlic & Herbs onto a cracker or baguette (preferably warm & crusty from the oven? )...for a moment of indulgence and escapism??..mmm! (add a glass of tempting Pinot Noir to make the moment even more special!) For all your mouth-watering moments - Du pain, du vin, du Boursin®.